Short Straddle is one of the sideway strategies employed in a low volatile stock. It usually involves selling At The Money puts and calls options with the same strike price, expiration date and underlying stock. You are expecting a drop in volatility or no movement of the underlying stock. Unlimited to the upward or downward movement of the underlying stock. Limited to the Net Premium Collected from the At The Money puts and calls options sold. This is a net credit trade as you are selling the puts and calls options of the same strike price and expiration date. Collect premium from puts and calls options and benefit from double time decay and a contraction in volatility. Potentially unlimited loss beyond the breakeven point in either direction if the strike price, expiration date or underlying stock are badly chosen. High risk strategy. Not recommended for inexperience traders. Simply offset the spread by buying back the puts and calls options that you sold in the first place. 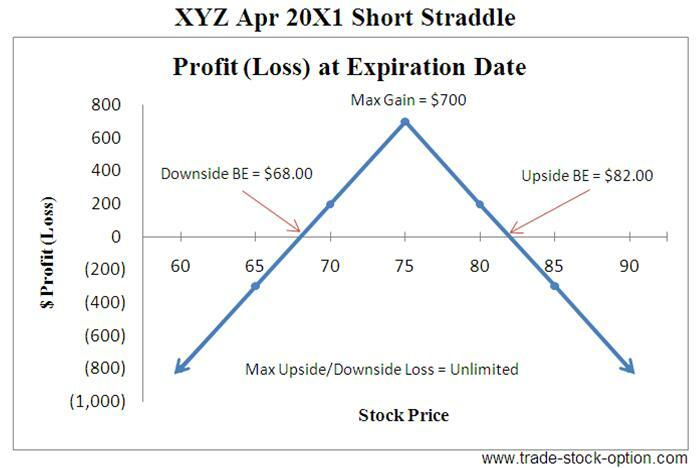 Assumption: XYZ is trading at $75.65 a share on Mar 20X1. You are expecting share price of XYZ to fluctuate back and forth within a range. In this case, you may consider to sell one Apr 20X1 $75 strike call at $3.40 and sell one Apr 20X1 $75 strike put at $3.60 to profit from the sideway movement of the stock. Note: commissions are NOT taken into account in the calculation. This options strategy is directly the opposite of a Long Straddle strategy and easier to understand. You just need to sell an equal number of puts and calls options of the same strike price and expiration date. Then you can make a profit when the stock fluctuates back and forth within a range. The maximum profit occurs when the underlying stock is trading at the strike price at expiration date (where both puts and calls options expire worthless). You get to keep the full amount of premium collected. This option strategy can be executed at any strike price but is typically established At The Money. Try to ensure that the stock is trading range bound and identify clear areas of strong support and resistance. Ideally you are selling the options when the implied volatility is high and receive above average premium. The stock is also anticipated to consolidate (become less volatile) and trading sideway for the duration of your trade. This is a net credit trade as you are receiving the premium for both the puts and calls options sold. Remembering that the last month of an option’s life has the greatest amount of time value erosion occurring. This is typically a bet on the volatility contraction. It is used to try to double the amount of premium collected compare to only trading one side of the market. However, do notes that you are exposed to potentially unlimited risk and you should NEVER trade this strategy right before news or earning announcement! You may be earning modest income on this strategy for a few months but one big loss will wipe off your years of gains. It’s just not worth it. You should pick the strike price and time frame of the Short Straddle according to your risk/reward tolerance and forecast outlook of the underlying stock. Selecting the option trading strategies with appropriate risk-reward parameters is important to your long term success in trading options. Typically used to limit risk of Short Straddle at the expense of lower profit. Next go to another sideways strategy, Short Strangle, to learn how profit can be make from a sideway market.